If timing were everything, this memoir would be No. 1 on all the bestseller lists, getting released the week of David Bowie’s unfortunate death and the release of his latest album. Alas, timing is not everything. The story of this book is utterly fascinating. It is the untold story—during the Summer of Love (1969)—when 22-year-old David Bowie shacked up with Mary Finnigan, a 29-year-old hippie mom with two young children who had left her uptight husband for Swinging Londontown. At the time, Bowie was about as far removed from his alter ego Ziggy Stardust as Mars is from Earth. He was instead a beautiful, androgynous young folkie who fancied the acoustic guitar. Bowie told Finnigan he was broke and needed a place to stay, and Finnigan offered him a spare room in her flat for five pounds a month. He accepted and though he barely paid the rent he did repay her in kind by becoming a friend and lover. All was heavenly until Bowie met Mary Angela Barnett, the infamous “Angie” who ultimately became Bowie’s first wife. Bowie moved her right into the flat with Finnigan. Finnigan decided to let them be. The memoir revolves around those formative few months when Finnigan, Bowie, and Angie turned a local pub into a music scene for up and coming singer/songwriters like Bowie. They dubbed themselves the Beckenham Arts Lab, and the high point was a free festival which Bowie headlined just before he hit the big time. As noted, Finnigan’s story (as well as the backstory of her time as a fashion writer who spent time in prison for a drug offense) is well worth hearing. The problem here is that this is not so much a book as a first draft. Finnigan should have enlisted the help of a professional ghostwriter to bring this book to life and make it all it could have been. Finnigan does have an innocence about her, almost like she’s never outgrown her flower power roots. She happily tells the story of how she flew off to India for a couple of months, leaving her two young children in the care of a couple who turned up on her doorstep and needed a place to stay. She also admits that, in the end, she believes Bowie never took her seriously and she wound up being one of the many people—men and women—he slept with. She’s probably right. After Bowie hit the big time as Ziggy Stardust—a creation Finnigan doesn’t care for—they two run into each other at a party. “When . . . I get up to leave, David puts an arm round my shoulders and escorts us to the door. I never see him in person or speak to him again. 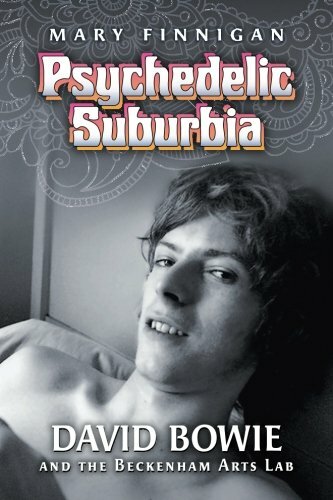 If you are a true Bowie fan, this memoir will shed light on what he was like just before he became a rock and roll God and for that alone, Psychedelic Suburbia gets a passing grade—but just barely.